Here is a recipe for the pizza I wrote about on friday. Actually, it's a recipe for the toppings. They will work on top of your favorite pizza dough baked your favorite way. I usually bake mine on a pizza stone in the bottom of the oven for 8-12 minutes at 500F to get it nice and crispy. If you haven't made pizza before, check out Stephen's blog for basic technique. In a medium sauce pan, combine figs, rosemary, honey, vinegar, and port. Cook over medium heat until the liquid turns syrupy and coats the figs, 10-15 minutes. 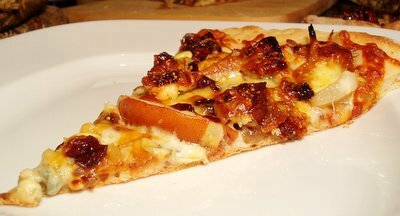 You'll probably end up with more figs than you need for the pizza, but you can use the leftovers with roast meats or on a cheese plate. Set a large skillet over medium heat. When hot, add the oil, onions, and generous pinch of salt. Cook stirring occasionally until onions are tender and golden brown, 8-10 minutes. Add balsamic vinegar, reduce heat to medium-low, and cook until onions are deep brown, 5-6 minutes longer. Roll out the dough on a floured surface to 1/4 inch thick. If baking directly on the stone*: Place pizza on a peel very heavily sprinkled with corn meal or semolina. If you don't have a peel, an unside-down cookie sheet covered with parchment paper will do the trick (don't forget the corn meal). Alternatively, place pizza on a cookie sheet. Spread a layer of onions, then figs. Pine nuts make a great addition. Sliced pears and/or dried cranberries are good too, and can even be used in place of figs. Top with shredded mozzarella and crumbled blue cheese. Sorry, I don't have exact measurements. But you are not really going to measure your pizza toppings, are you? Position the peel with the pizza over a pizza stone and yank the peel from under it. Or place the cookie sheet with pizza on the stone (or directly in the oven if you don't have the stone). Bake until the cheese melts and the crust browns, 8-12 minutes at 500F. *Warning: Transfering pizza with toppings onto the stone is a bit tricky and can result in toppings falling off and burning. To avoid having dinner to the sound track of your fire alarms, bake pizza on the cookie sheet unless you are an experienced pizza baker. Fantastic recipe!! Just what I was looking for!